The city’s largest sky garden! Far East Consortium has revealed a pioneering 4,000m2 vertical green rooftop at its Upper West Side development. It is one of the largest raised green roofs in the Southern Hemisphere. Located in the heart of Melbourne’s CBD, between Spencer, Bourke and Lonsdale Streets, Upper West Side’s communal rooftop represents almost one acre of landscaped podium rooftop gardens, lounge areas, barbecue spaces, resort-style pool (Tower Three) and ‘The Bouldering Cave’ – an innovative horizontal rock-climbing wall area. Its contribution to sustainability has been recognised with a 4-star Green Star rating for each tower. Designed by Cottee Parker Architects in conjunction with njr and associates, Far East’s green rooftop amenity cost about $3.5 million and includes a range of soft and hard landscaping features to enable greater recreational opportunities for residents, setting a new standard for inner-city living. Lead architect, Shane Williams of Cottee Park Architects said the space was designed to allow residents and their visitors the opportunity to relax in a space as close to a natural environment as possible despite living in an apartment building. “When designing Upper West Side’s outdoor rooftop spaces, we carefully considered how each plant would establish over the next 10 to 20 years, choosing plants that had colour, vibrancy and variety, with fruit-bearing, flowering and edible vegetable species included to ensure we could create a sensory pleasing garden for residents,” says Shane Williams. 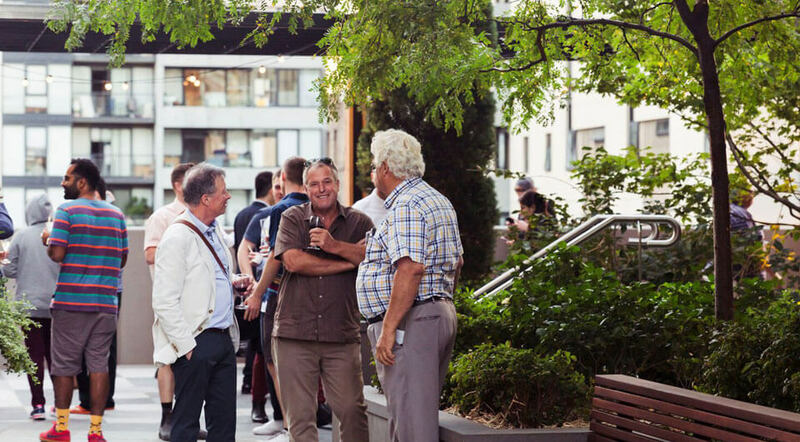 At the launch event on March 28, 2018, attendees enjoyed the impressive rooftop space with Acting Lord Major Arron Wood, Parliamentary Secretary for Treasury & Finance Daniel Mulino (Deputy Treasurer present to formally cut the tape. Craig Williams of Far East Consortium and Landscape Architect, Nick Rivett were presented with the Green Space Urban Award, by Wayne Val Balen, President of the Australian Institute of Horticulture. An energetic Costa Georgiadis, from Gardening Australia, reminded us all how far the technology in drainage and planting has come, allowing us to successfully grow mature trees and maintain luscious, green spaces within high density, inner city precincts such as Upper West Side. The green roof is home to over 12,000 plants, covering a total acre of space which envelopes the built form creating private gardens, recreational areas, spaces to cook, eat and relax. The Upper West Side development also launched Melbourne’s first official street art precinct, giving new life to the once cold concrete jungle in the west end. Key collaborators were Juddy Roller and Citipower/Powercor, along with Australia’s best street artists Adnate, Dvate, Fintan Magee, Rone, Smug and Sofles. Upper West Side has really become a catalyst for a new type of urban growth that will transform the way the city of Melbourne lives and breathes into the future.